Any submerged oyster bar, reef, rock, or area represented as an oyster bar on the charts of the Oyster Survey of 1906 to 1912, and its amendments, or any area declared by any circuit court to be a natural oyster bar, or any area on which DNR plants oysters or shells. Oyster bars are great habitat for oysters, crabs and all types of fish. Watermen and fishermen use the charts to locate oyster bars. These charts are not water proof but they are large enough to follow the intricate shorelines of the state. Each black and white chart is approximately 36 by 50 inches. The oyster bars are clearly marked and labeled, using the chart number – NOB number. 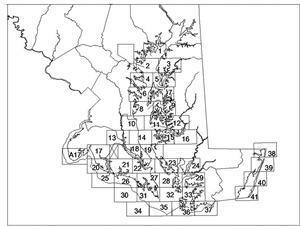 Additional information on the charts are labels for rivers, creek, and bays, contour lines, marshes and conditional boundaries like water quality and required county restrictions. Each is labeled in the area where they apply. Choose the chart you need by selecting the number of the chart. There are 42 total charts for the areas indicated.